Posh: Has Robbo already revealed his hand? Judging by his most recent team selections Peterborough United manager is close to deciding his strating line-up for the opening League One match at Rochdale on August 8. 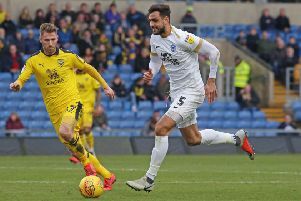 The Posh squad has pretty much split into two groups with an experienced team turning out on Saturdays and a much younger team going into action in midweek matches. Barring accidents, injuries and surprise signings, Robertson looks likely to pick the most senior players for the trip to Spotland. Goalkeeper Ben Alnwick will see off the top form of young Dion-Curtis Henry, while the full-back postions in a 4-4-2 formation will be occupied by Michael Smith and Kgosi Nthle. Gaby Zakuani and Ricardo Santos appear unthreatened as first-choice centre-backs. Transfer-listed Shaun Brisley is the only fit alternative. Jack Collison (if fit) and captain Michael Bostwick appear certainties for central midfield. Joe Newell and Jermaine Anderson have both performed well in pre-season though and will be battling for a game if Collison isn’t risked. Marcus Maddison and Jon Taylor have been the main men on the wings, but Maddison in particular might have reason to worry about teenager Harry Anderson’s excellent summer form. And it appears unrealistic to expect anything other than a strike partnership of Conor Washington and Joe Gormley, unless the touted arrival of a Premier League player on loan comes true. That leaves new signings Kieran Sadlier, Andrew Fox, Lee Angol and Souleymane Coulibaly all fighting for places on the substitutes’ bench. Sadlier pressed his claim for an appearance at Rochdale with a stunning goal in Tuesday’s 2-1 friendly defeat at Grimsby, a first reverse of the summer for Robbo’s men. Robertson naturally won’t confirm his plans for the League One opener, but said after the Grimsby match: “Kieran is one of many players who are pushing for a game at Rochdale. “He’s done very well and his goal (at Grimsby) was magnificent. “We have great competition for places, particularly in midfield and some of the less experienced lads are showing their worth. “Tobi Adebayo-Rowling was again very good at Grimsby for instance. “Harry Anderson is another player who excites me, especially when he is running at defenders, while I felt Lee Angol also played well at Grimsby , but I have a strike partnership in Joe Gormley and Conor Washington that is developing very nicely.